Clean freaks share their secrets. 1. 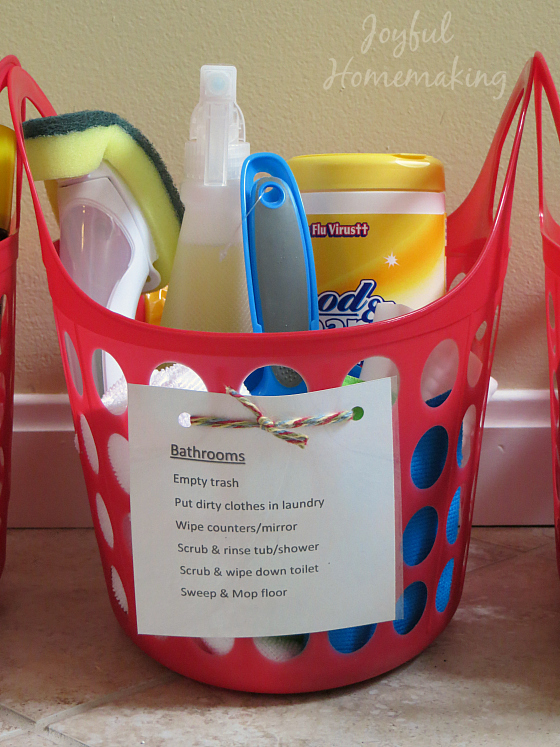 Keep cleaning supplies in every room. "I keep cleaning supplies in basically every area of my house. I find that if I have wipes nearby and I notice something needs to be cleaned, I’m way more likely to do if I can just reach down and grab what I need, rather than having to walk to the other end of the house." See how one family uses this system on Joyful Homemaking. 2. If something takes less than two minutes to do, do it now instead of procrastinating. "I have a rule for myself that if something takes less than two minutes to do, I do it now instead of later. This keeps me from just leaving stuff lying on the floor and telling myself that I’ll pick it up later [which I won't]." 3. Start a cleaning session by turning on your laundry machine (and any other gadgets you may have). "Every time I clean, I begin by starting all the machines in my house. I start the dishwasher if it’s full or can be filled, I start some laundry and the dryer if I need to, and then I can proceed to the rest of my cleaning. It’s so nice knowing that things are being cleaned hands-free while I’m working on other things, and it really sets the tone for a cleaning sesh!" Here are some useful laundry tips to get you started. 4. Do one huge declutter to minimize how many things you own (and ultimately, need to clean). "Do one huge declutter and after, be very picky about buying new items and what other people bring into your home. When you have a lot less stuff, it's much easier and faster to clean and organize." If the idea of purging your home of unnecessary clutter excites you, read up on the KonMari Method — among other things, it'll teach you how to curate a closet that brings joy, why you should tidy by category, and how to organize everything in an accessible and visible location. 5. Wipe your iPhone and laptop screens. It is the thing you stare at for most of your day. Here're instructions on how to clean your screen with a diluted alcohol solution. 6. Clean while you cook. It's a productive way to kill those random chunks of time while waiting for your pasta water to boil or your cookies to bake. 7. Make your bed right when you wake up — it'll instantly make your entire room look clean. "Always make your bed — I make mine while I’m waiting for my primer to set in. A made bed makes a room look so much cleaner." Since your bed makes up the majority of your room, it makes sense that the clean look of it alone would have such an all-encompassing effect on the overall look of your room. To make the bed-making process even easier, ditch the top sheet for an extra cozy duvet cover. And if you're not convinced yet, here are 24 more reasons why making your bed is the best way to start your day. 8. Empty your dishwasher to discourage dirty dishes. "I’m fully convinced that the key to a clean house is emptying the dishwasher. The moment the dishwasher is cleaned — but not emptied — is the moment everything goes downhill. One or two plates left in the sink somehow gives people permission to slob out." 9. Embrace crisp, white sheets, and you might actually wash them regularly. "I only buy white sheets and towels, so I can bleach them. The white keeps everything looking so crisp and it just inherently feels cleaner to me." If, for whatever reason, you'd prefer to not bleach your sheets, you can soak soiled white sheets, towels and clothes in Oxy Clean and water for 30 minutes to an hour, or try one of these techniques. 10. Use lavender oil and baking soda to make vacuuming an aromatic experience. "Sprinkle a combination of baking soda and an essential oil all over the carpet, wait 30 minutes, vacuum, and bask in the lovely smell of your crazy clean carpet." 11. Never leave a room empty-handed. "I make it a habit to never leave a room empty-handed. There is always something that needs to be put wherever I’m going, and I take it with me." Keeping shoes off your floors will keep them clear of all the dirt, allergens, and bacteria your shoes step on throughout the day, reduce wear-and-tear on your carpets and wooden flooring, and help you relax into your clean home. Designating a place for the dirty footwear to go can help — try making this quick shoe tray. Then slip on these fluffy flamingo slippers ($24.95) to stay warm on your cold tile. 13. Dedicate 15 minutes a day to cleaning. "I always dedicate at least 15 minutes a day to cleaning. Whether it’s while the coffee is brewing or I’m just trying to wake myself up in the morning, I can always find 15 minutes. Once you make it a habit, fitting it in becomes very natural and you’ll find yourself doing little things like wiping down the counters or making the bed with all those spare minutes." There's a ton you can accomplish in 15 minutes, like cleaning your entire bathroom. 14. Get inspired on Pinterest. "I always start a cleaning by watching Parks and Recreation and scrolling through Pinterest looking at really pretty houses and organized desks. By the time I'm done, I have a Leslie Knope-esque determination and Pinterest-level ideas, and I can get on a roll." Just make sure you limit your Pinterest browsing, or you may accidentally pass the entire day scrolling through decorating tutorials. Look through DIY ideas here and here to get started. And for more inspiring organizing or decorating ideas, follow us on Pinterest!